Villa Rebecca is situated in a quiet and peaceful location on the edge of the typically Spanish village of Villaverde, and has uninterrupted views to the nearby extinct volcano, Montana Escanfraga. Villa Rebecca is very spacious and has a large open plan lounge and dining area, separate kitchen, utility room which has a washing machine, 4 bedrooms and 3 bathrooms (2 en suite). The gardens are secluded and there is a private heated pool with terrace and also a private roof terrace and is therefore suitable for naturists. Fueteventura is famous for its many miles of golden beaches (including numerous blue flag beaches) and the weather is very similar to that of Florida and Mexico which are on the same latitude, making this the ideal holiday location. And there is nowhere else in the Canaries with so many enormous sand dunes and long sandy beaches - there are more than one hundred and fifty, thus making them some of the most impressive beaches in the whole of Europe. 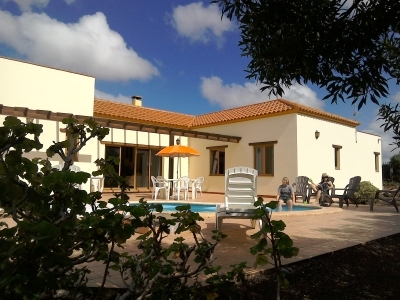 Villa Rebecca is very spacious and has a large open plan lounge and dining area, separate kitchen, utility room which has a washing machine, 4 bedrooms and 3 bathrooms (2 en suite). The gardens are secluded and there is a private heated pool with terrace and also a private roof terrace and is therefore suitable for naturists. Villa Rebecca is only a 5 minutes walk to nearest restaurant, and 10 minutes walk to a well stocked supermarket. The villa has a complimentary starter pack for when you arrive. The terrace has table and chairs for 8 and there are a number of sun beds. There are views of the mountains from the terrace and spacious gardens. There is a kidney-shaped swimming pool, which is approximately 5 metres (16' 3") by 3 metres (9' 11") at the widest points. Electric pool heating is provided, without charge, all year round (thermostatically controlled). The property is enclosed by walls for greater privacy and there is a large private roof terrace. The separate kitchen (with a serving hatch into the dining area) has a four ring ceramic hob with full oven and grill, extractor fan and light. Also a dishwasher, microwave, refrigerator/freezer, coffee maker, electric kettle and is equipped for cooking for 8 people. The laundry room has a washing machine, iron and ironing board. The villa has a spacious open plan lounge and dining room with a central fireplace separating the two areas. The lounge has double patio doors opening onto the large sunny south facing terrace. There are two large leather sofas and the lounge comes complete satellite television with DVD and a CD/cassette/radio mini system. The dining room is equipped for 8. The master bedroom (off one end of the lounge) has a king size double bed, large built in wardrobe with safe (no charge is made for this), bedside cupboards, chest of drawers and wall mirror. The en-suite bathroom has a bath with shower over, toilet and hand washbasin. The second bedroom again has a king size bed, large built in wardrobe, bedside cupboards, chest of drawers and wall mirror. This en suite has shower, toilet and hand washbasin. The two other bed rooms each have two single beds, a built in wardrobe, bedside cupboards, chest of drawers and wall mirror. These two bedrooms are served by a shower room off the hallway with a toilet and hand washbasin. The villa is on mains electricity. With all the accommodation set on one level, Villa Rebecca is ideal for those with walking difficulties and for small children. The villa is a 5 minute walk from local restaurants and a 10 minute walk to the nearest supermarket. There is an extra charge of 70 euros per week for pool heating.